Why Does My Cat Need Yearly Exams? Download our new FREE App!!! 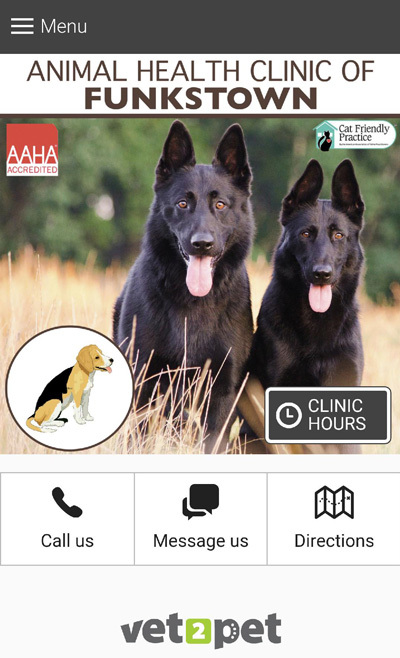 Receive notifications about important pet health and hospital updates! Request appointments & medication refills right from your smart phone! Join our new Loyalty Rewards Program! Shop our online store right from your phone! Send us a Selfie Shot of your BFF! Please contact us if you have any further questions or would like to schedule an appointment. Our Funkstown veterinarians offer a wide variety of pet care services including spay and neutering, general exams, vaccinations, and much more. Contact Animal Health Clinic of Funkstown today to schedule an appointment at our Funkstown, Maryland veterinary office.